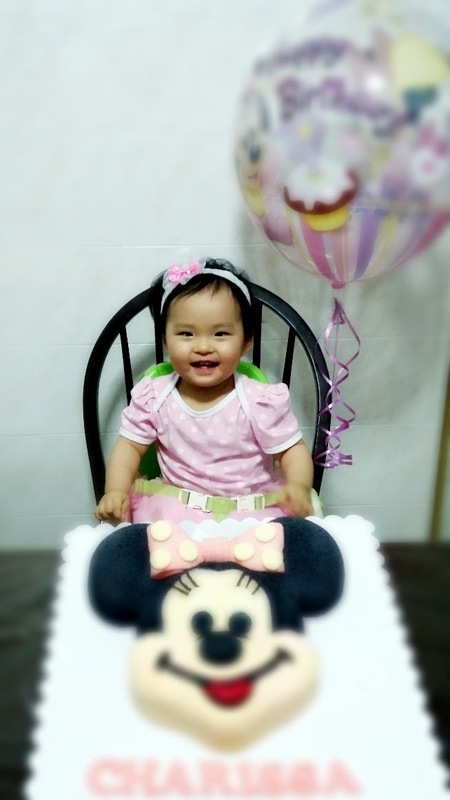 Minnie Mouse Chiffon Cake (my baby's 1st birthday)! My dear little Charissa is turning 1 year old today! Time flies and can't believe my baby is growing up. 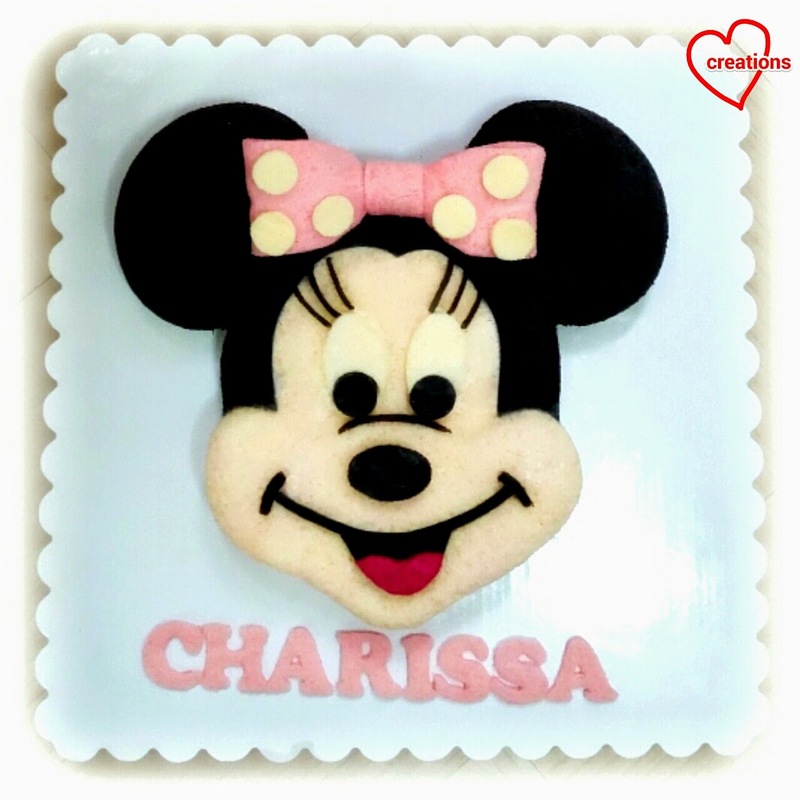 The Minnie Mouse theme was suggested by my elder daughter Tintin as Charissa looks a little like the baby Minnie Mouse hee. The chiffon cake is made of charcoal and plain vanilla chiffon cake that is steam baked which gives it an ogura-like cottony quality. I find that steam baking really helps with the texture when not baking chiffon cakes in tube pans. 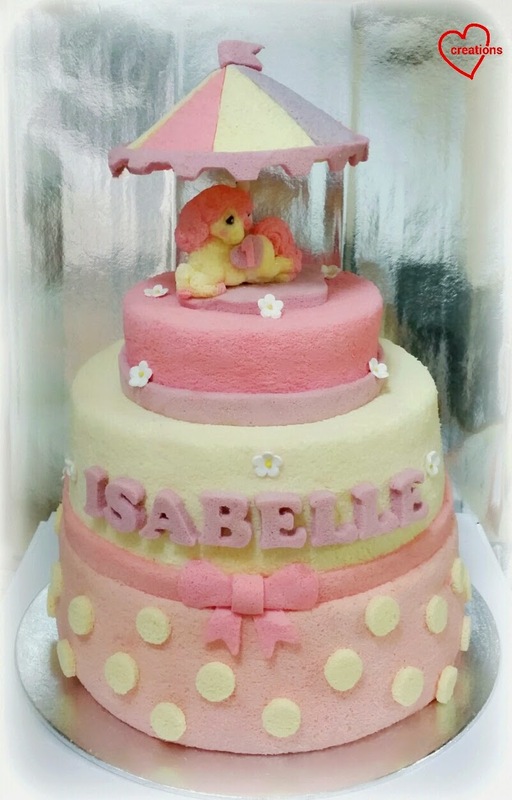 The facial features and bow were cut and shaped from chiffon cake baked as layers in trays. That's her with her Minnie Mouse cake. The cake and balloon look big beside her! May you continue to bring so much joy and grow up to be full of grace. Happy 1st Birthday Charissa!! My kids are requesting for baos again! After a hiatus of a few months, I finally have time to return to my first love in the "baking" arena. In my quest to find the right balance of soft fluffy bao skin and really runny salted egg custard filling, I have tweaked the recipe or preparation conditions quite a few times. I usually succeed in getting fluffy and soft baos but the filling is rather thick and not as runny as the ones you get at restaurants although the taste is pretty close. I am glad to say that I think I have found the right balance this time and the kids agree that this is the best batch of liu sha baos I have made so far! And it remains runny even after freezing and resteaming! All the colouring you see are from natural ingredients. 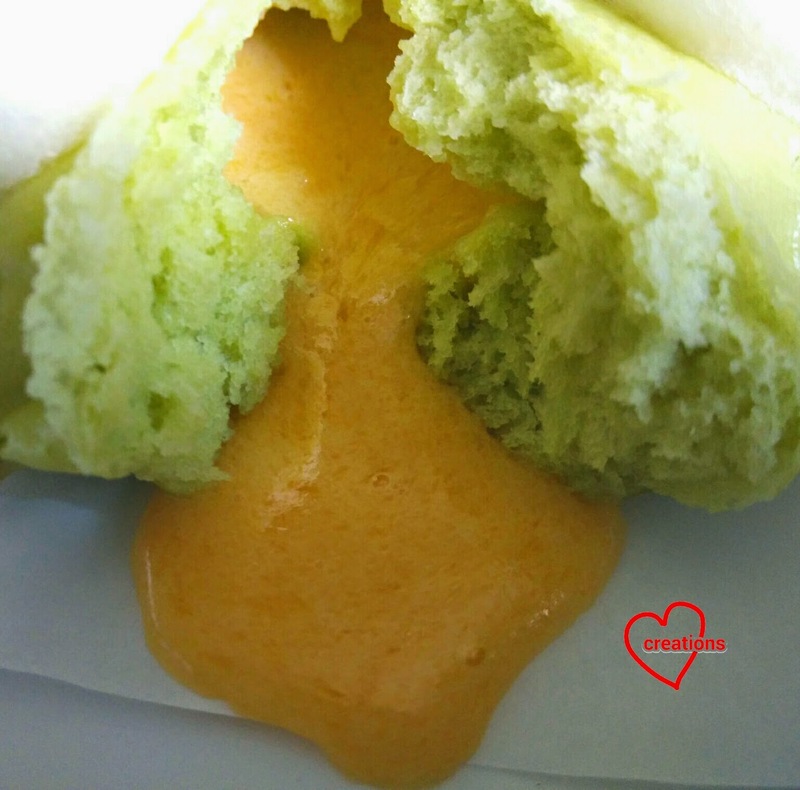 Since the filling contains coconut milk, pandan flavoured bao skin compliments it very well. Prepare pandan juice by blending about 20-25 pandan leaves in 100ml of water and squeezing out the juice from the pulp wrapped in a cloth coffee filter. 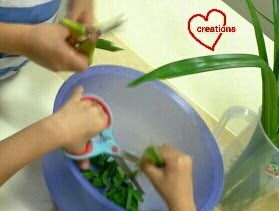 Cutting the leaves, blending and squeezing out the juice is so simple that kids can help. 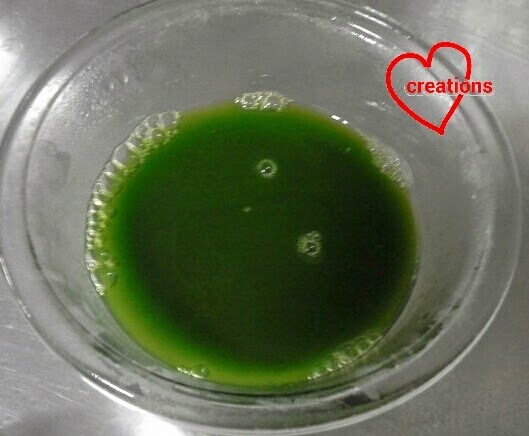 You may choose to let the juice settle overnight and use the dark green portion that settled at the bottom but it is not absolutely necessary. I mentioned in my previous liu sha bao post that I will attempt liu sha baos again with an increase in liquid content and decrease in solidifying agent to make the filling more runny. 1. Mix butter and sugar together until well combined. Add all other ingredients and mix well. Sieve the mixture to break up the big lumps of salted egg yolk as well as removing any bits that can't be broken up. 3. Chill in the fridge until firm, about 1h or overnight. 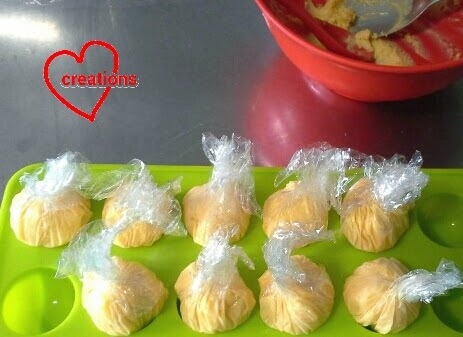 Portion into individually cling wrapped balls of 17g and freeze it. This can be prepared a day ahead of time. My kids sampled the leftover filling in the bowl and gave it a thumbs up! The recipe for bao skin is similar to the one I have always used with a slight difference in proportion of dry and wet ingredients. 11g vegetable shortening (You may replace with vegetable oil or butter. But I find the skin drier with vegetable oil and butter lends a noticeable flavour to the bao skin. If you prefer buttery skin, do use butter :)). 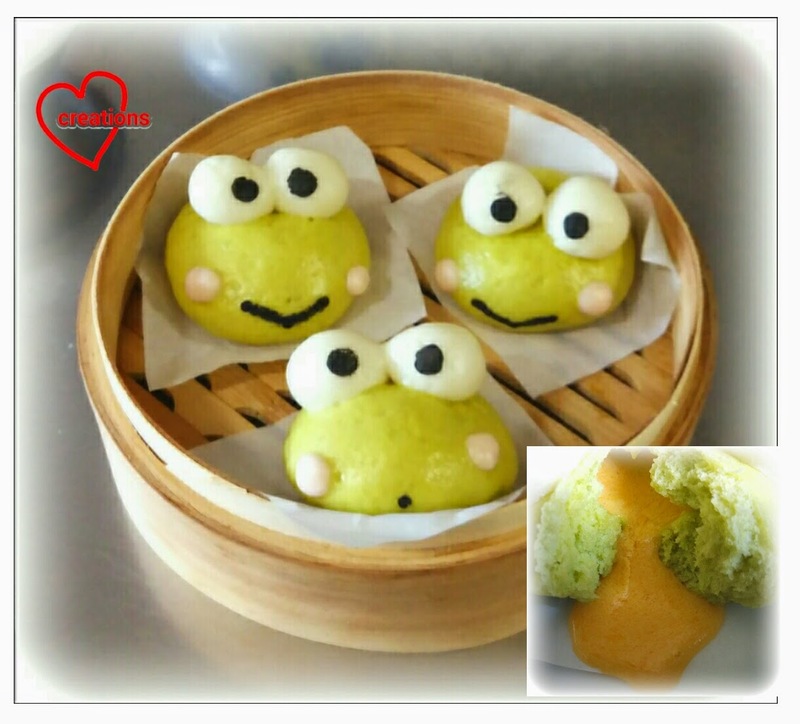 *Use one-fifth to one-quarter of the recipe to make the dough for Keroppi's features. 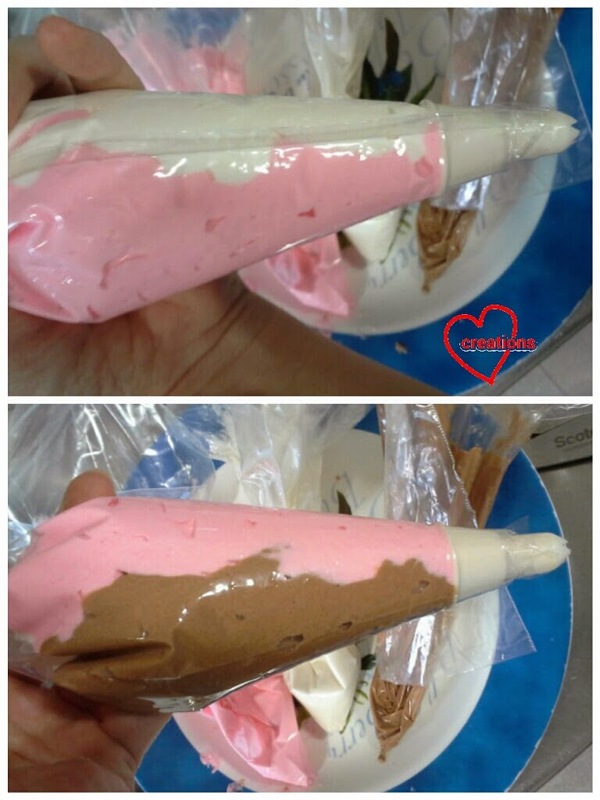 Or if you are lazy, simply colour some green dough white/pink/black with gel food colouring for the features. 1. Mix the first 5 ingredients in a bowl. 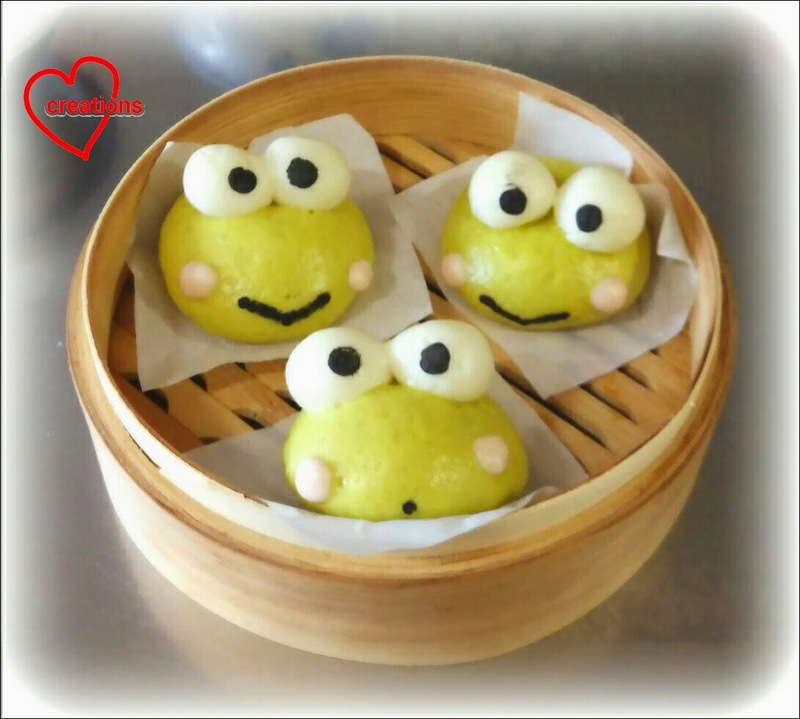 Add pandan juice (or water if you are making plain dough for Keroppi features) and mix with a wooden spoon until a dry dough forms. 2. 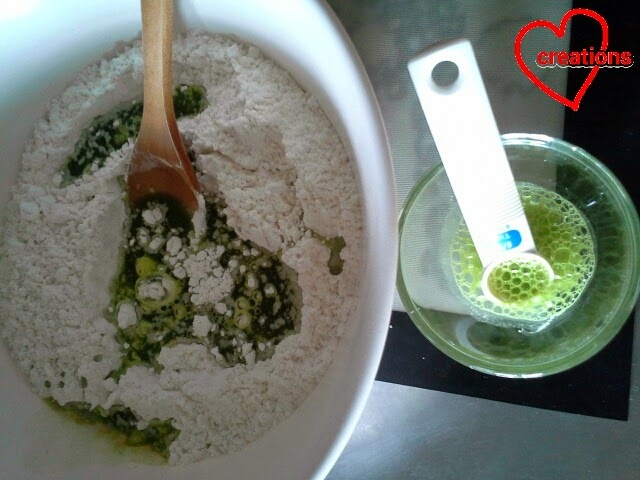 Dissolve baking powder and ammonium bicarbonate in 1/2 tsp of water/pandan juice. 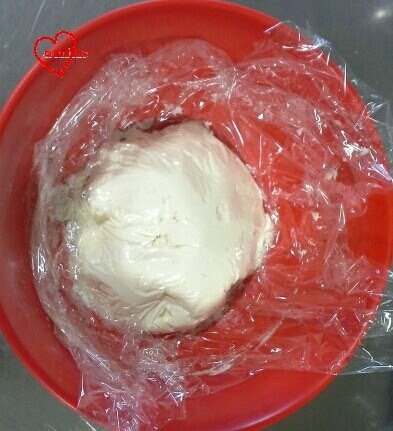 Gradually add the baking powder mixture into the dough by kneading it in. 3. Pour the dough onto a non-stick mat and gradually knead in the shortening. Continue kneading for 15-20minutes or until the dough is smooth and elastic and passes the windowpane test. You may let a stand mixer or breadmaker help you with the kneading but I prefer doing it by hand as I can feel the dough taking shape. 4. Proof the dough in a large bowl/measuring jug covered with cling wrap until almost doubled in size. About 25-30 minutes in hot Singapore or about 3 hours in the fridge. Punch down the dough and knead a few times to expel the trapped air. 5. Portion out the dough and add any food colouring at this point. I prepared the pandan and plain dough separately. 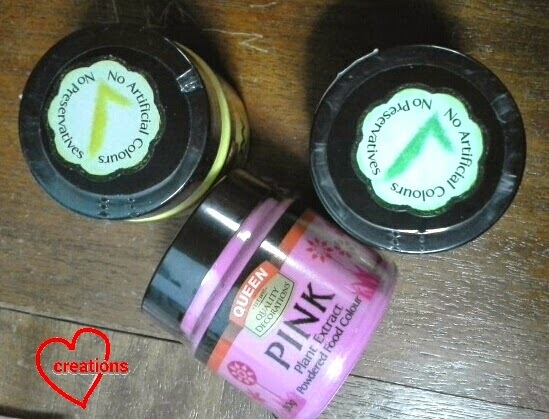 I found some powdered food colouring from plant sources. All natural! Available at Cold Storage in Malaysia but sadly not seen in Singapore. 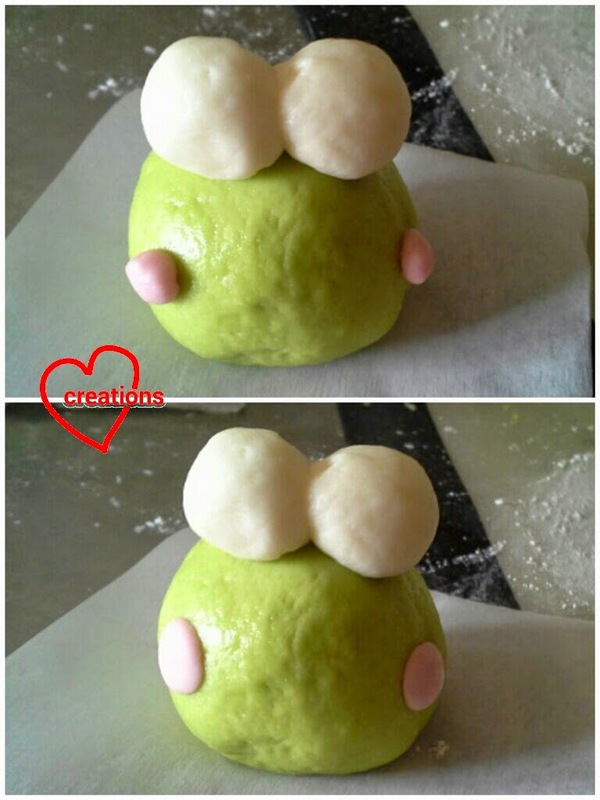 I used the pink powder to colour the dough for Keroppi's cheeks. 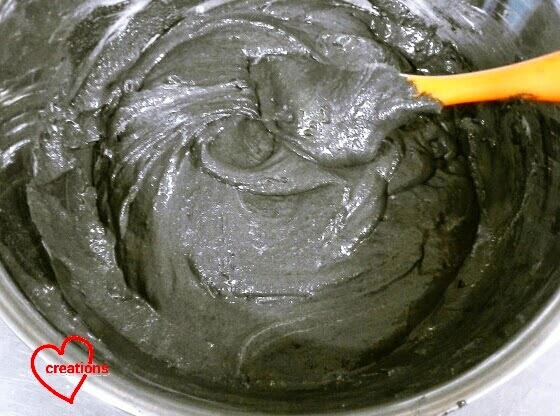 I actually didn't prepare the black dough but did the lazy way of painting on the black parts with charcoal powder dissolved in water after the baos were steamed. This is fine provided you don't accidentally smudge it. 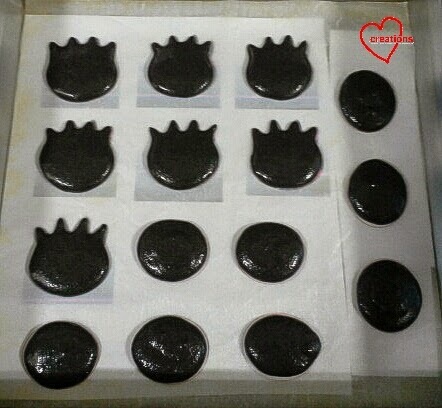 I have painted on black features in the middle of steaming the baos before using charcoal dissolved in egg yolk but this method may not be suitable for liu sha baos which are temperature and time sensitive during the steaming process. Important note: keep any resting portions of dough wrapped in the fridge to avoid over-proofing as you are portioning, colouring and assembling. I love the natural green hue! 6. Lightly flour your work surface with bao flour. Take a ball of green dough and flatten it. 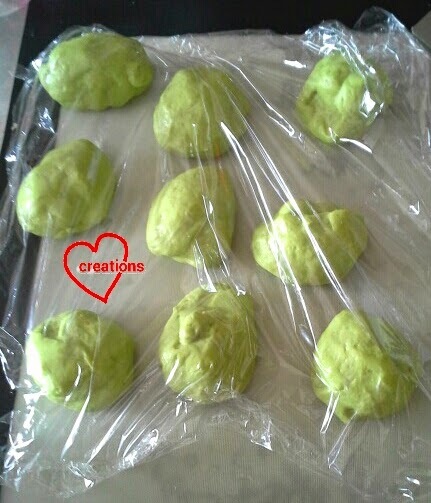 Place a frozen ball of filling in the middle and wrap it, pinch sealing the dough. Place the assembly seam side down on a piece of baking paper. Add on the features. In order to stick on the cheeks, pinch out a bit of pink dough and stick onto the bao. With a lightly floured finger, gently flatten the pink balls onto the bao surface as shown below. 7. Proof for about 35 minutes at room temperature (about 28°C in the kitchen in Singapore) before steaming at high heat for 6 minutes. Make sure that the water is at a roiling boil. Turn off the heat and let the baos rest in the covered wok/ steamer for 3 minutes before opening the cover. Do not over steam the baos as they may explode or the filling will not be as runny. Baos are best eaten freshly steamed. If you are not consuming immediately, freeze the baos in ziplock bags after they have cooled completely. Resteam for 11-12 minutes without defrosting before consuming. Not exactly the prettiest looking but we are yummy! My kids had much fun eating these! Because the filling was so drippy, they pulled off the eyeballs and dipped in the filling to eat! I am very blessed to know wonderful mummy friends from Charissa’s group. 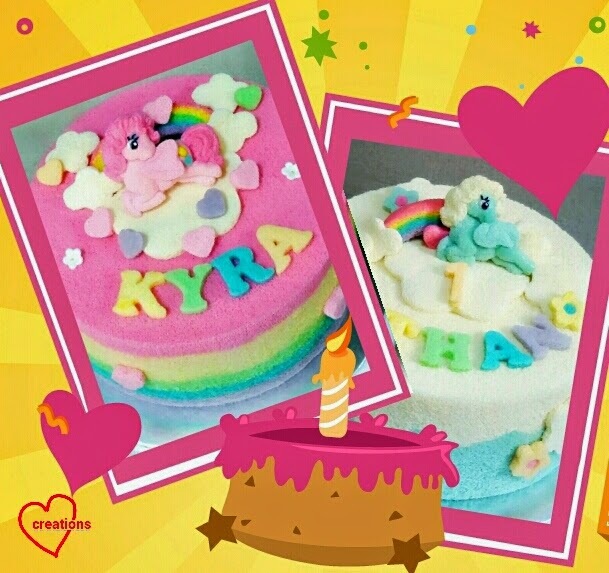 It was such a coincidence that two of them requested for “My Little Pony” birthday cakes the same week. They were for a very special girl, Kyra and a very special boy, Ethan. Knowing the mummies and how much the babies were loved, each cake was lovingly created with them in mind. 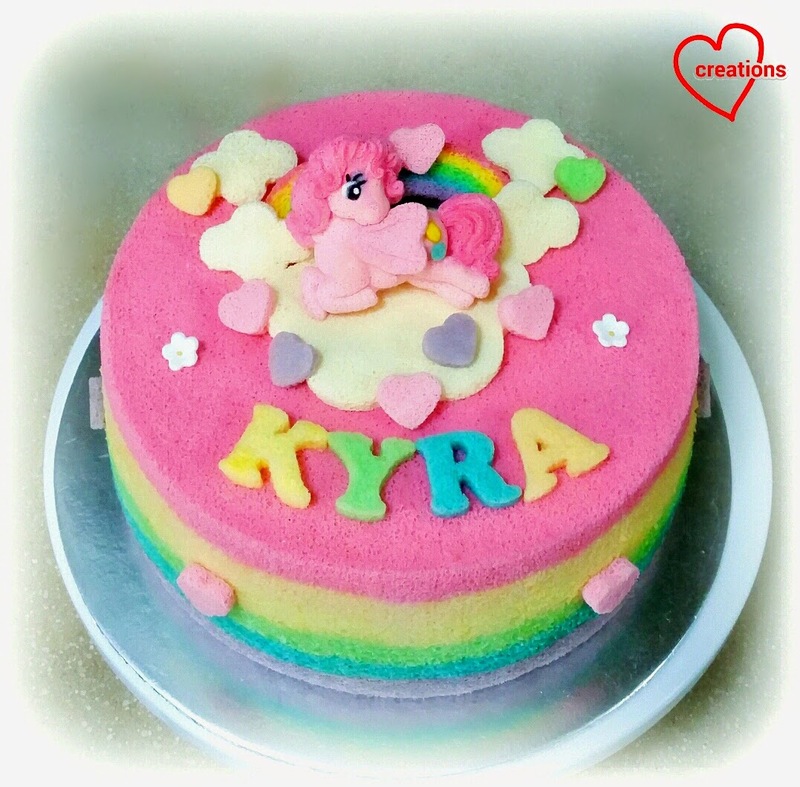 For Kyra, a sweet pink Pony on top of a pink rainbow chiffon cake. I added eyelashes and wings like in “My Little Pony” and made the Pony look like she was soaring over the landscape of rainbows and clouds. The rainbow is a trademark in “My Little Pony”, and this was also made of chiffon cake, made by layering chiffon cake in rainbow colors in a small oval bowl (and then slicing them up). 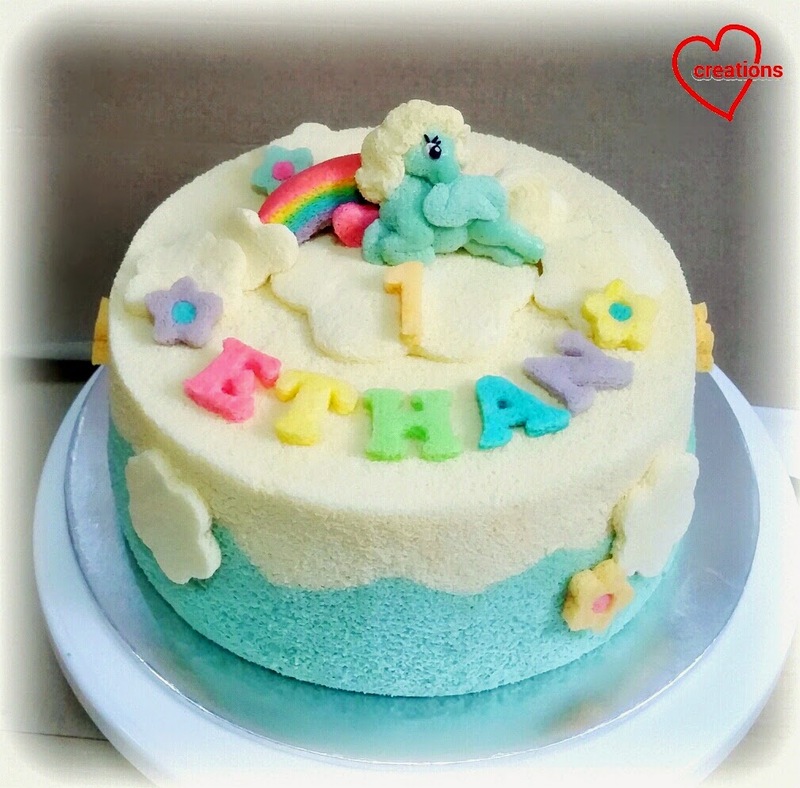 For Ethan, a handsome blue Pony on top of a cloud-sky chiffon cake. Ethan’s cake was also reduced sugar (85%) for his grandma's sake. His cake was a modification to the waves of the Frozen chiffon cake but making the waves ‘filly’ instead of gradual to look like clouds. I am very thankful the Pony cakes were well-received, but more so thankful to be baking for the precious bubs (and my precious friends). 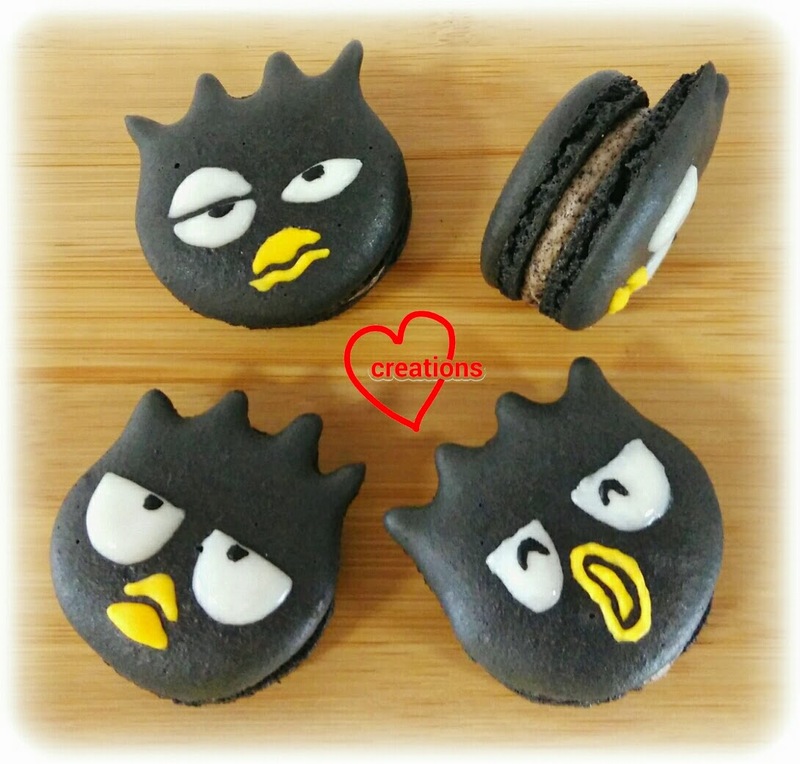 Here are some Badtz Maru cookies and cream macarons for a friend who is a fan of Badtz Maru! 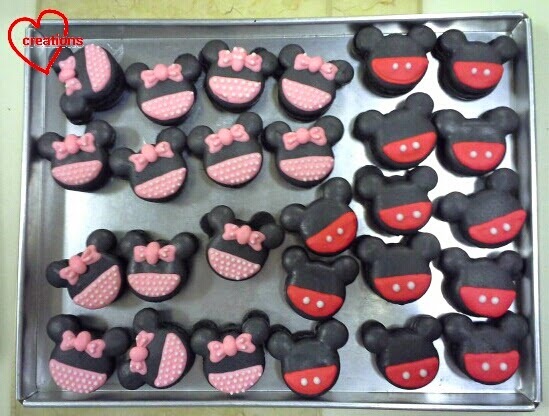 Actually I made these from leftover batter for Mickey and Minnie mouse macarons. 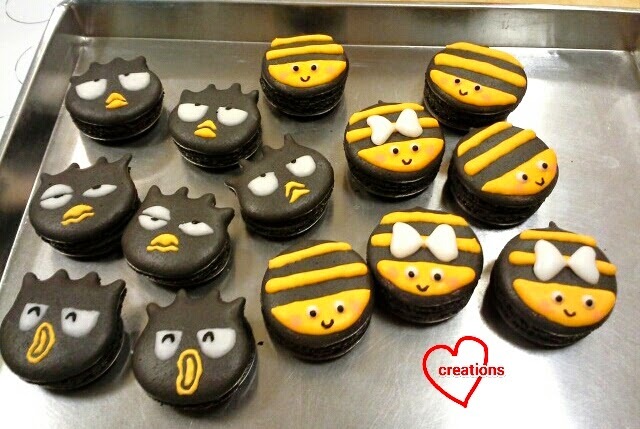 I made some absolutely cute bumblebee macarons with some of the leftover batter alongside these Badtz Maru ones. 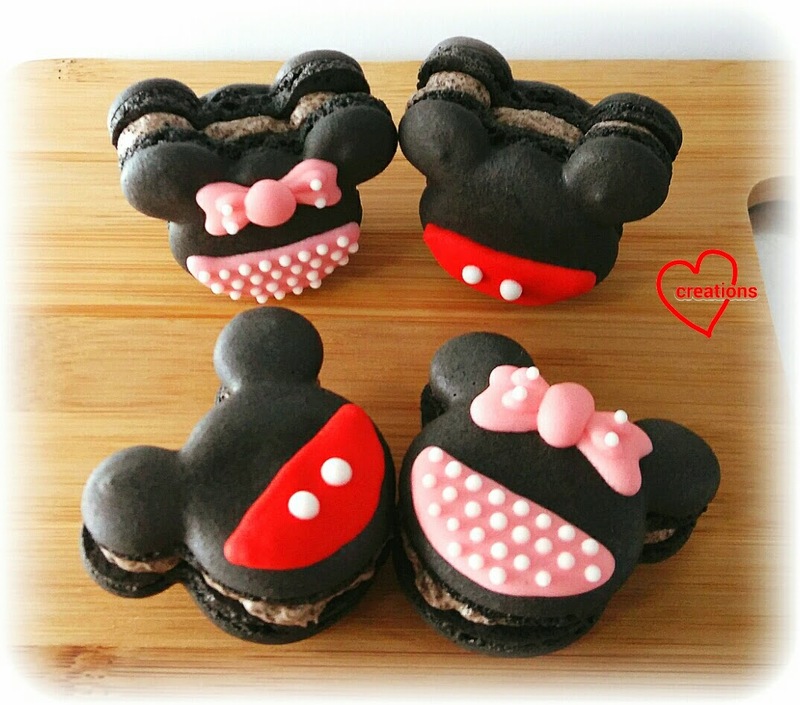 Please refer to the recipe from my Mickey and Minnie macarons. The only difference is in piping the shells and painting/piping on the facial features with royal icing. 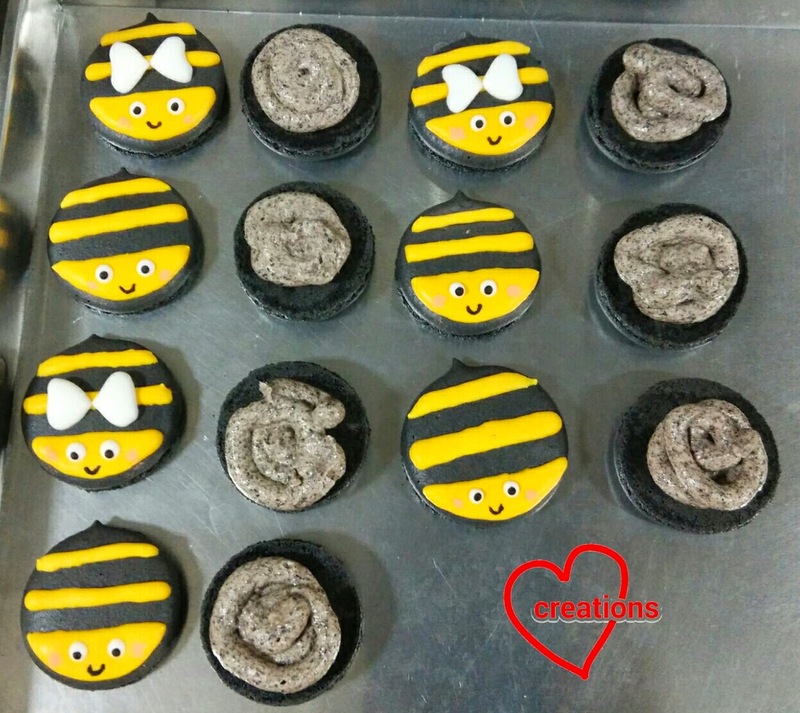 I used the exact colours of icing as my bumblebee macarons. Use a toothpick to pull the batter to make the spikes on the head. You may choose to make a mirror-imaged shell for the bottom piece but I piped ovalish shells for the bottom piece. 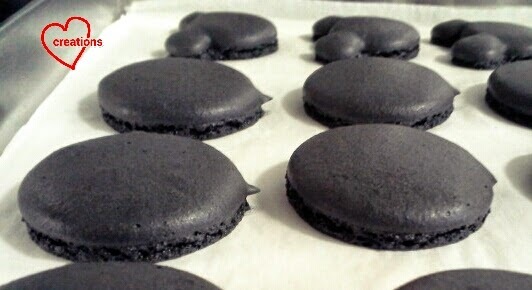 Freshly iced macaron shells! Don't they look gorgeous?! 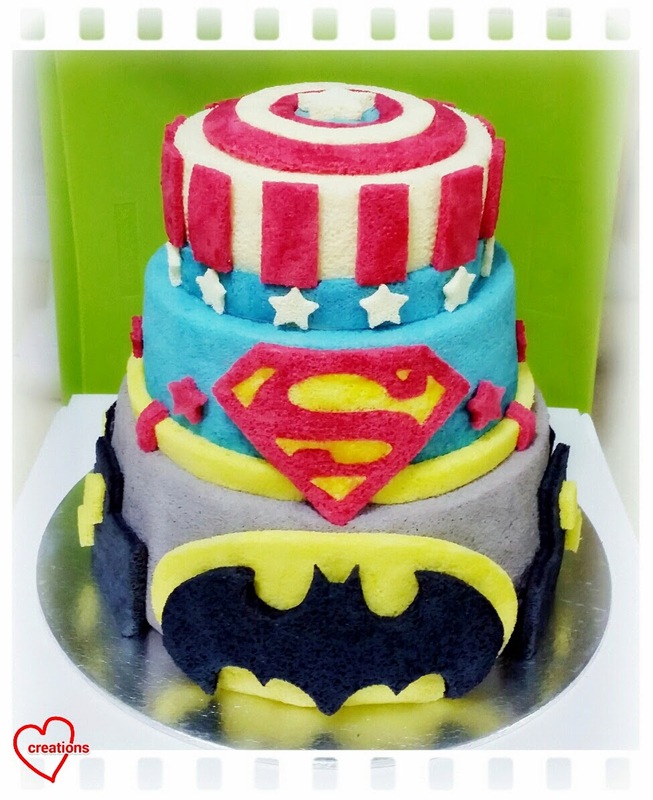 This is a Superheroes 3-Tier Chiffon Cake for my friend’s 3 fabulous boys celebrating birthday together! The 3 tiers represent different superheroes: top is Captain America, middle is Superman and the bottom is Batman! It’s somewhat like the coming together of my previous chiffon cakes (Navy Stripes Gun, Superman Boxers and Spiderman). I wanted the cake to have some sort of a "super" old-school Hollywood glamour feel hee. Really thankful my friends shared the cake was super yummy and well-received! Happy birthday to the boys and happy new year everyone!! Hope everyone is having a SUPER (huat) new year! 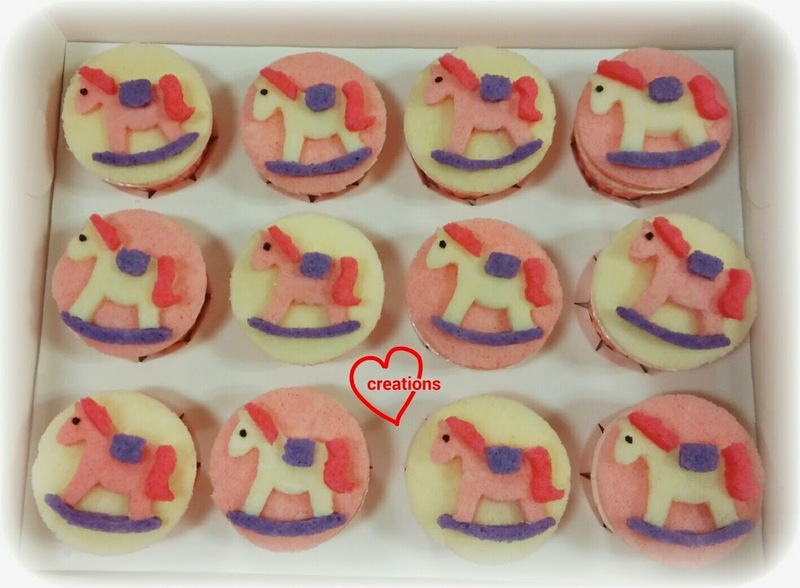 I have a request for horse cupcakes for a little girl's birthday so here they are! ...is quite a lot of work! 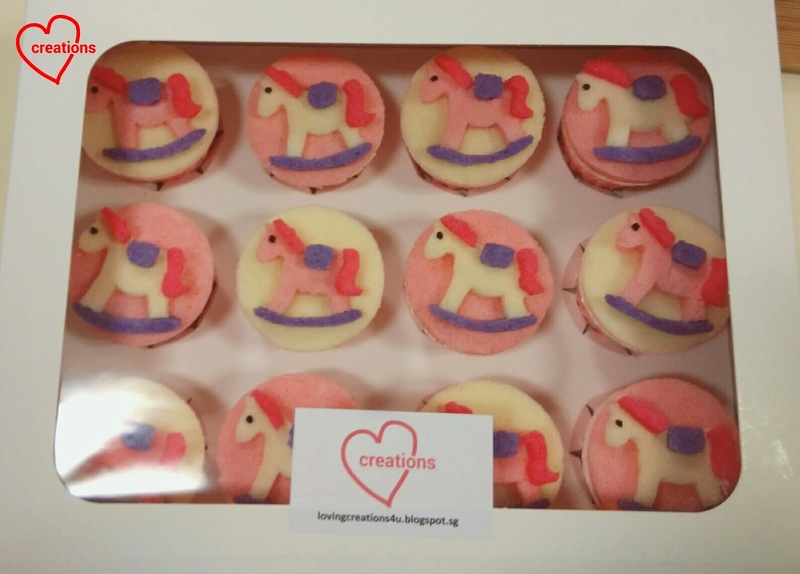 I was seeing stars by the end of assembling 16 cupcakes as the individual parts of the horse has to be cut out with a small knife, and then glued together with melted marshmellow. Only the external outline of the rocking horse was done with a cookie cutter. As usual, the cupcakes are fondant-free. 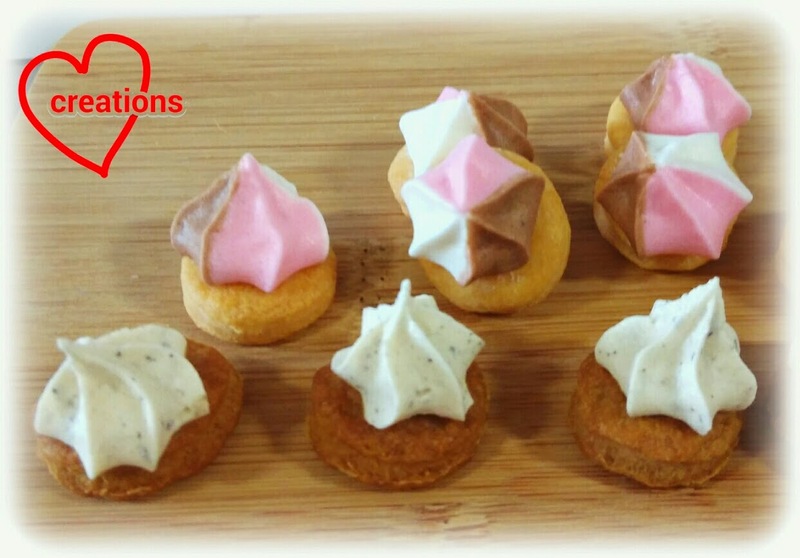 Vanilla flavour with a tinge of lemon and less sweet was requested so the recipe is specially tailored. You may refer to this recipe for the basic vanilla cupcake but with 3 egg yolks instead of 1, milk with 1 tsp of lemon juice used instead of water. 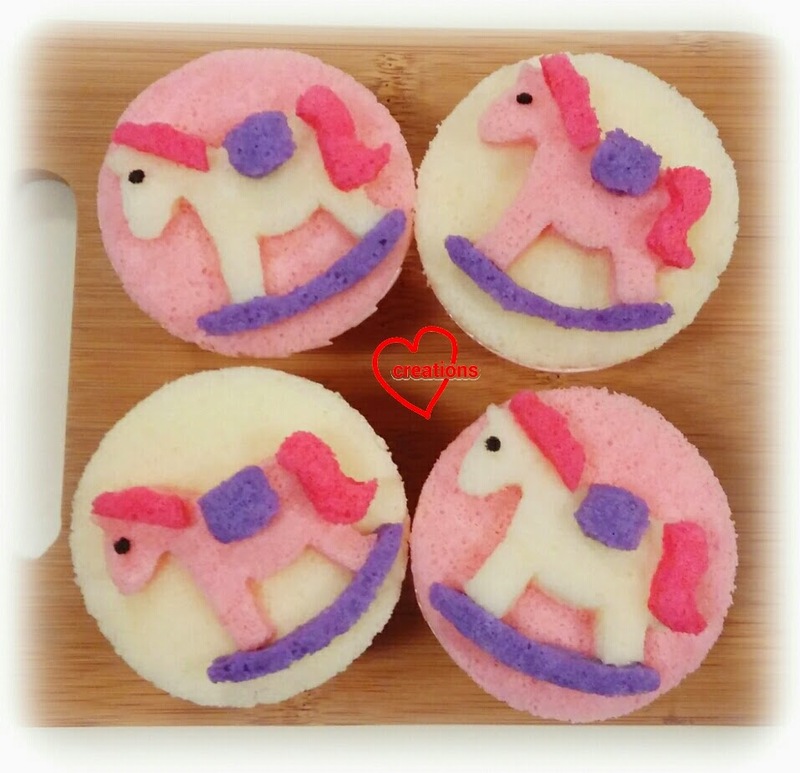 Bake some white, pink and purple layer cakes for the horse design. 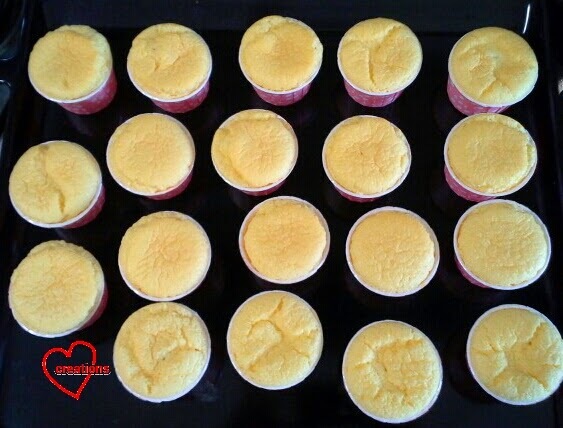 Remember to brush the tops of the cupcakes with simple syrup (1:1 ratio of water:sugar) to keep them moist as they will be left out in the open for quite a while at the party. 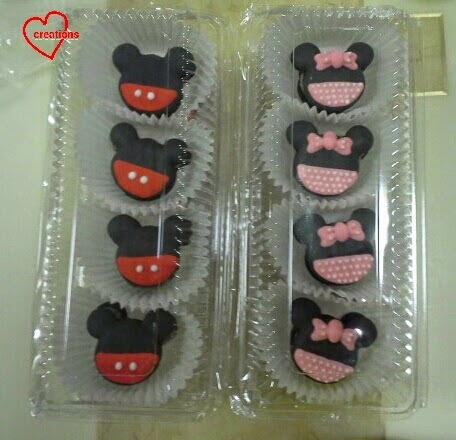 You may store the cupcakes in air tight container in the fridge for a few days to keep them fresh. Thank God that the cupcakes were well received together with Susanne's awesome cake! This bake is also just in time to bid farewell to the Year of the Horse! Have a Blessed Chinese New Year everyone! Thanks for supporting us this past year since we started blogging! 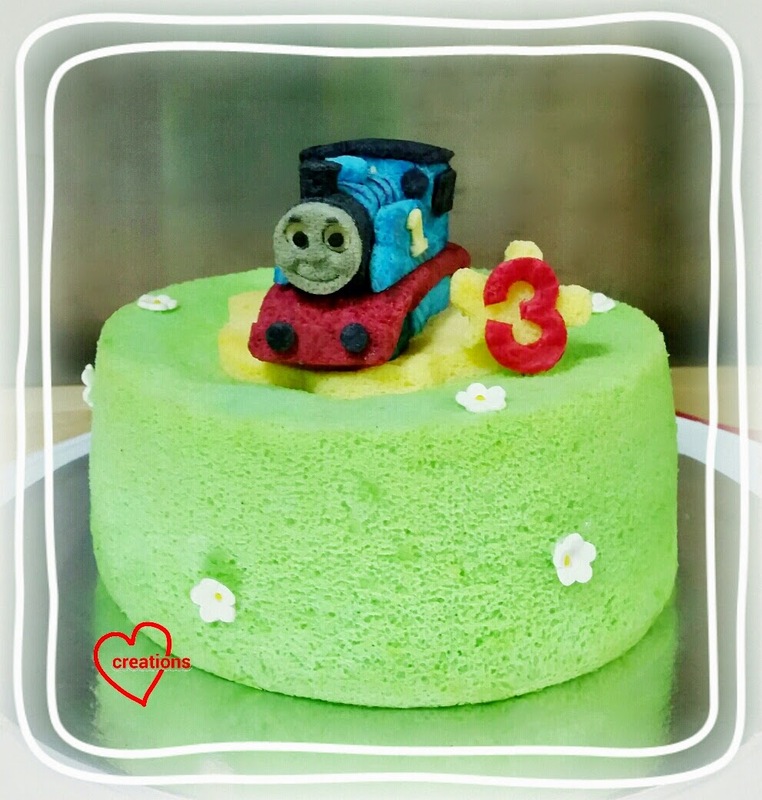 This is a Thomas the Train handcrafted from chiffon cake for my friend’s son. It was really difficult to craft the train topper from chiffon cake and I almost died doing it! Thank God cake was well-received and their smiles (shared by my friend) are one of the best rewards. Valentine’s day is coming. May everyone have a blessed and meaningful day with your loved ones! 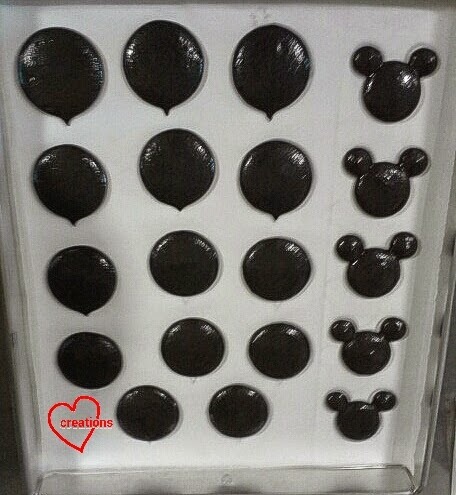 Remember I mentioned I have some leftover macaron batter that I played with after the Mickey and Minnie macs? This is one of the two creations that came about! Bumblebees with and without wings! 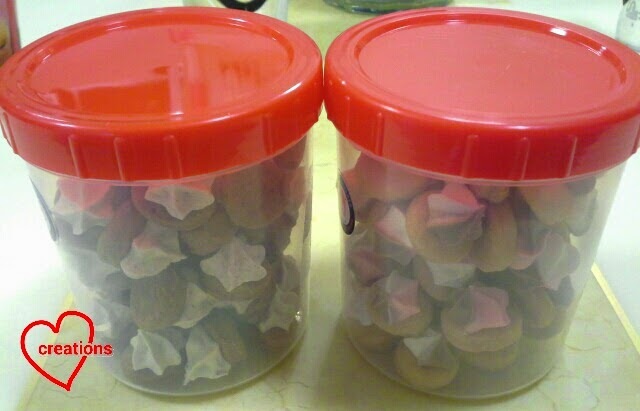 I couldn't find a suitable box for them so they ended up in my elder kid's lumchbox. No, the bees didn't go to school. They may cause a pandemonium of they did :p.
I mean, who can resist the rosy cheeks, absolutely cheerful disposition and cute little stings?? I actually had difficulty cutting a bee in half for my kids to share (my kids don't take much chocolatey stuff in one sitting). Too cute!! 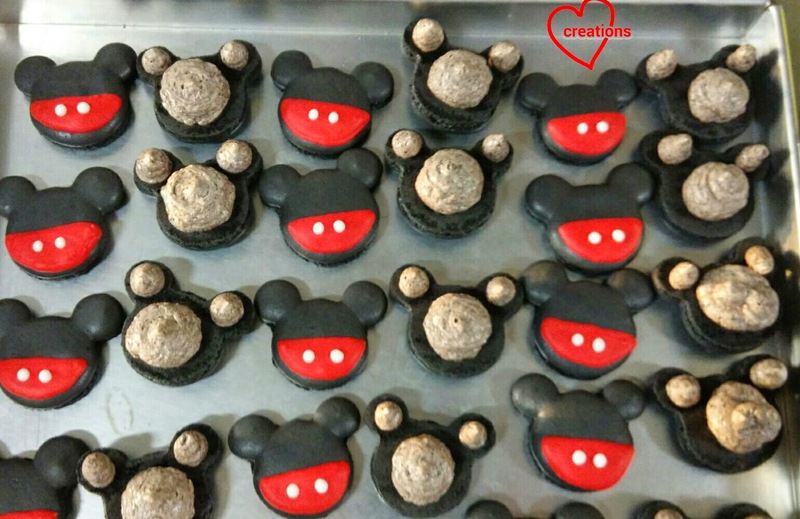 Please refer to my updated Mickey and Minnie macarons for the recipe. I will highlight what is different here. Pipe circles for the bee's body and use a toothpick to pull the batter to make the sting. You may choose to do the same for the bottom shell or leave them as circles. I iced the shells with royal icing. 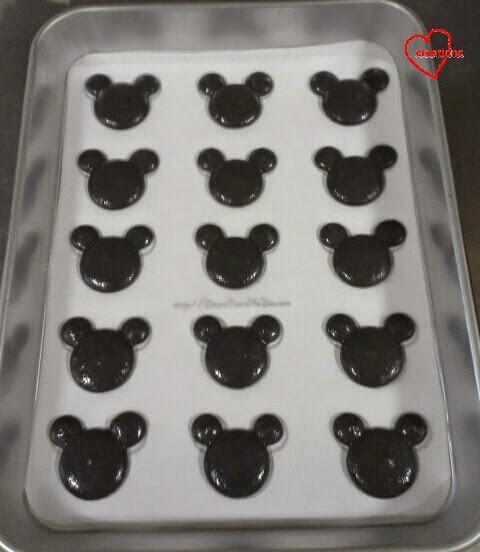 The wings are made by piping small hearts on baking sheet and oven drying at 60°C until dry. Carefully remove the hearts from baking sheet. I stuck the wings on with a dab of royal icing. The rosy cheeks were made by brushing on some peach coloured Lustre Dust (edible powder food colouring) and knocking off the excess powder. I used yellow and teeny bit of red gel colouring to make the deep yellow colour of the bees' stripes. 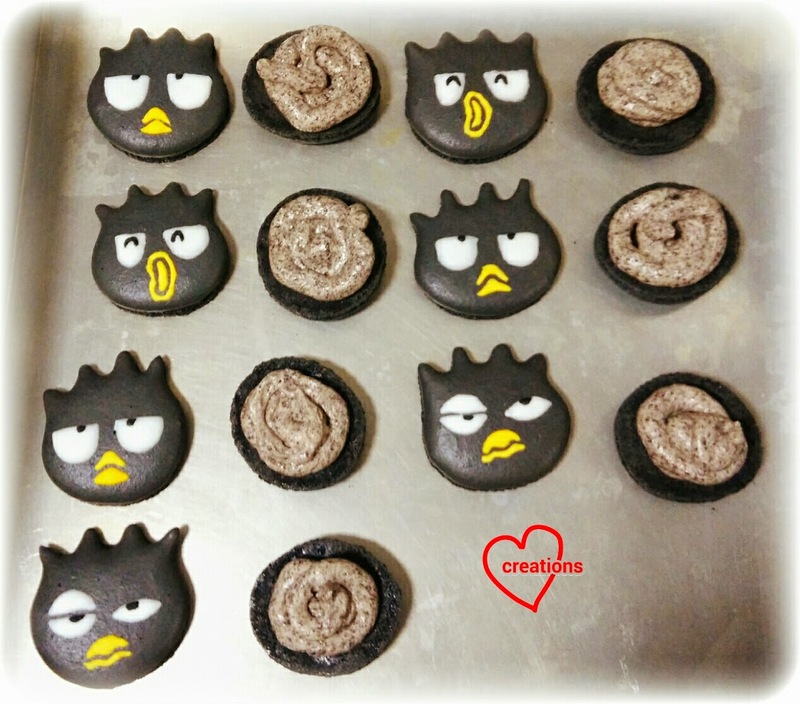 Charcoal was used to colour the icing black. Filling up with cookies n cream swiss merigue buttercream! This is less challenging to pipe than say Snoopy or Peppa pig but so hard to eat because of the cute overload! If you give this a try, you may experience the same difficulty as me! 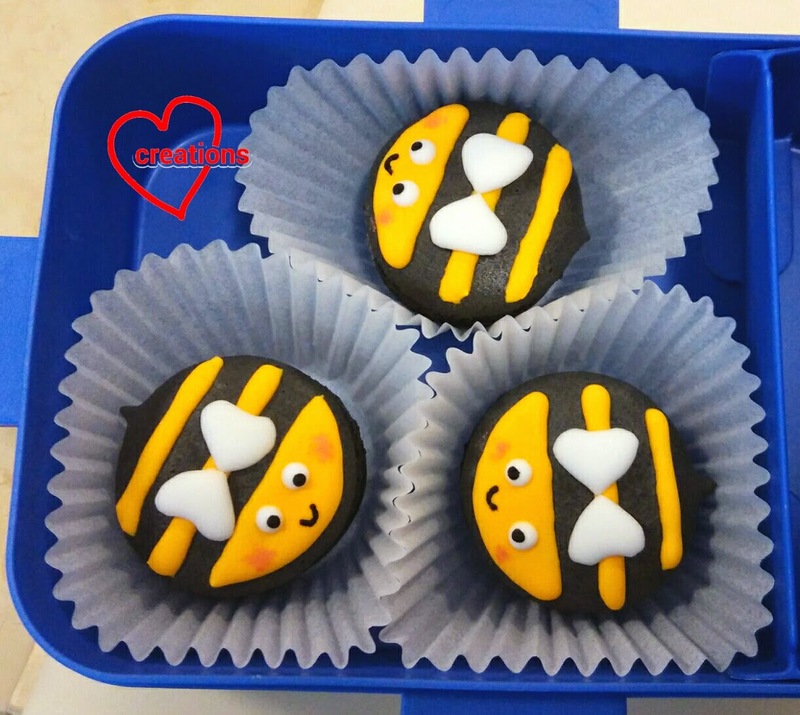 A friend mentioned that these bees would make great Valentine's Day gifts. I can see why! With the cute stings, winsome smile, rosy cheeks and a cheesy message that says "Bee my Valentine", who can resist?! 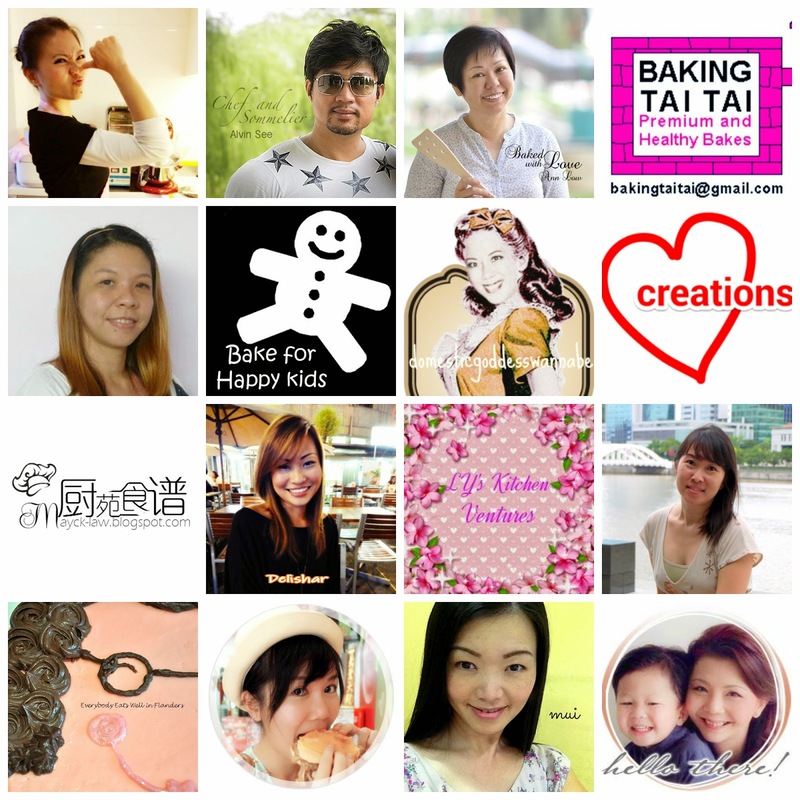 I am submitting this post to Best Recipes for Everyone Jan & Feb 2015 Event Theme: My Homemade Cookies organized by Fion of XuanHom’s Mom and co-hosted by Victoria Bakes. For the first time, we are joining 16 fabulous cooking bloggers to bring you the chance to start the Year of the Ram in the best way - by winning an ang pow! Leave a comment in the Combined CNY Giveaway Post for a chance to win! 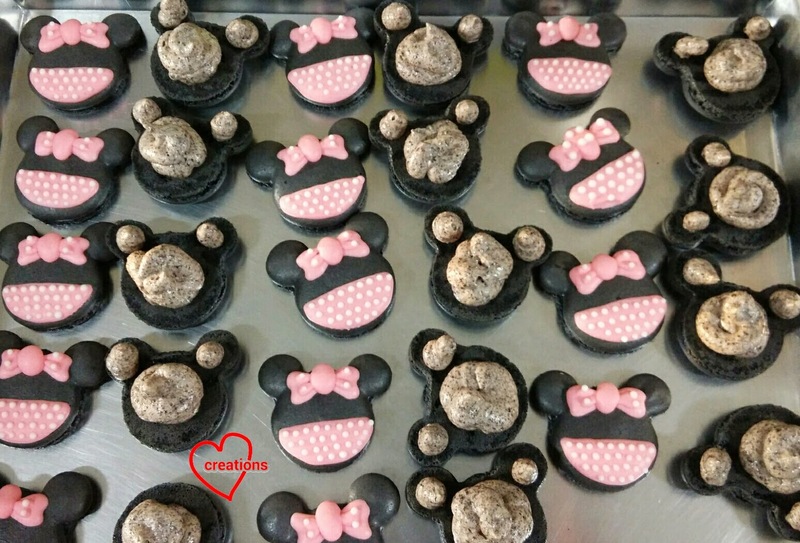 Someone requested for some Mickey and Minnie mouse macarons with cookies and cream as the flavour. But this time, Minnie is dressed in pink and adorned with more polka dots! I made some slight modifications to the recipe for the shells and filling from my first attempt. I increased the amount of charcoal and cocoa to make use of more natural colouring and flavour. The addition of vanilla bean paste is to enhance the flavour too! Many thanks to Susanne for this gift otherwise I will not have vanilla bean paste in my possession. I have to confess that I had to junk my batch of French buttercream (buttercream that uses egg yolks like in my previous Mickey macs attempt. I tried a different French buttercream recipe.) Much as it is nice to be able to use up all that excess egg yolks from making macaron shells, French buttercream is just a little too tricky for me. 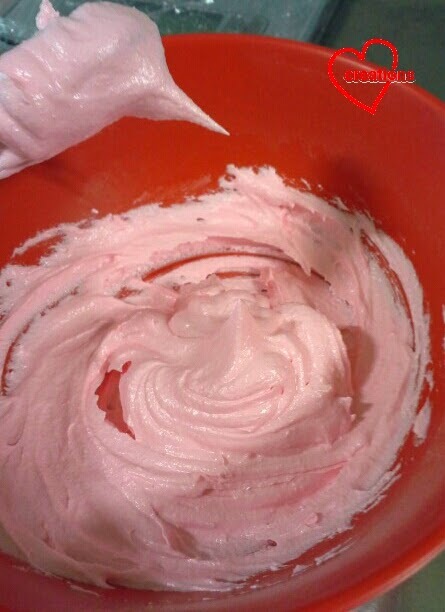 The cream separated and I couldn't salvage it so it's back to good old foolproof swiss meringue buttercream! Beside a change in recipe, I used a mix of oven drying and aircon drying of the shells to get the optimal drying time for fit my routine as aircon drying takes way too long and oven drying tends to result in shells that are too dry. Since I have 5 trays to dry, I can't dry them in the oven all at once. By the time the last tray of shells are dry, the first tray would have been sitting out for quite a while. My panda and Peppa Pig macarons have feet that are not as beautiful due to this reason. Check out the feet from this batch of macs! 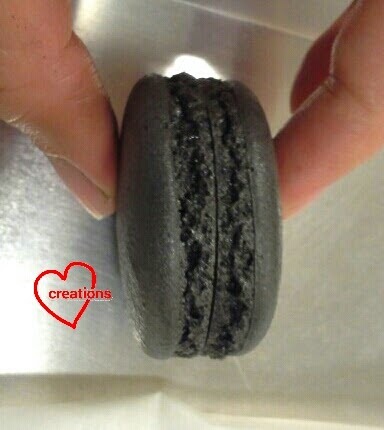 Please refer to my previous macaron shell recipe for the detailed steps. I will highlight the changes here. Prepare the mass and Italian meringue. As usual, be careful not to overfold the batter during macaronage. Pipe batter onto baking sheet with template under. I dried each tray of shells in the oven at 60°C fan mode for 10-15 minutes before aircon drying until it is time to bake. Total drying time for each tray is about an hour. If you can fit all your trays in the oven, by all means oven dry them in one round and just ramp up the oven temperature when they are dry. Pardon me for not using more natural colouring this time :p. I am really busy and needed to speed things up by making the icing in one batch. 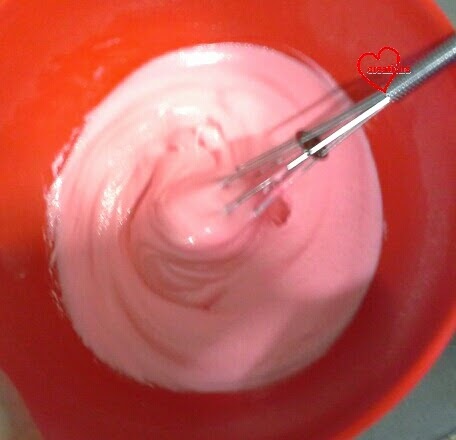 I have found the optimal whisking time for royal icing, which is around 5-6 minutes of continuous hand whisking. You may use the electric mixer if you don't like the hand exercise. Do adjust the consistency by adding more water or icing sugar. Any peaks in the icing should disappear in 10 seconds. Please refer to this recipe for the basic smbc. Just omit the Horlicks and water in the recipe. Beat in crushed oreos until well combined. Transfer to piping/ziplock bag and pipe the filling onto the bottom shells. Place the top shell on and refrigerate until it is time to serve. Keep the macs in airtight container. They can keep for a week plus in the fridge. 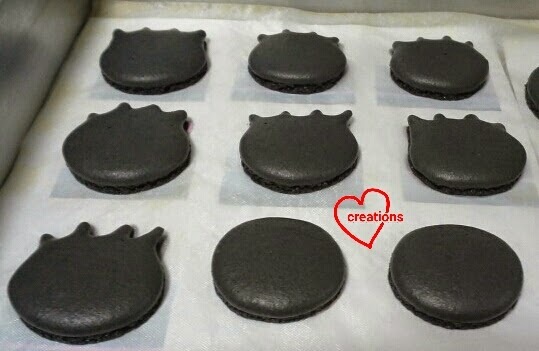 I have some extra batter (didn't use all up for these mice) which I made full use of to create two other designs of cute macarons. 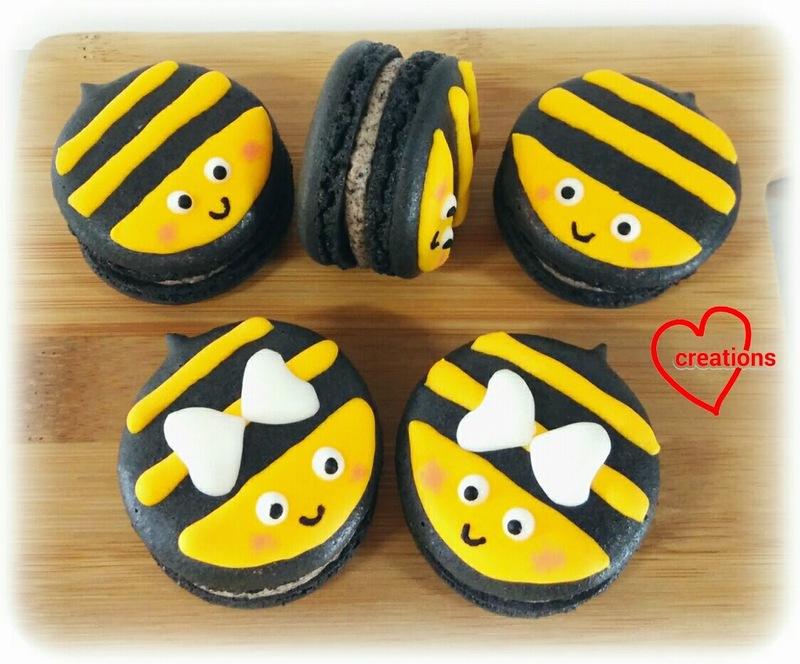 Check out my cute bumblebee and Badtz Maru macarons!